Oxford Film Festival Take 5 With...: Get well soon, Mr. Freeman! Get well soon, Mr. Freeman! Ever since we heard the news this morning of Morgan Freeman's car accident, we have been on the edge of our seat with worry. But we are relieved to hear that his injuries, while serious, are not life-threatening. Maybe he will finally take some time off, and stop working so hard! We were fortunate enough to have Mr. Freeman join us last February to open the 5th Annual Oxford Film Festival, but did not know for sure until the day itself if he'd be able to make it because his schedule is constantly changing. 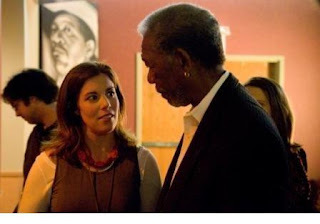 Danny Klimetz caught this photo of Freeman with co-director Molly, with the Malco mural of Freeman in the background. If we'd asked him to pose in front of it, he would have thought it was ridiculous.